A look at the U of M's workers' rights union. What started as a living wage campaign at the University of Tennessee has grown into a statewide union advocating for workers' rights at multiple schools, including the University of Memphis. Disgruntled by the unfair treatment of employees at UT-Knoxville, campus workers there began a living wage campaign in 2000 in hopes of negotiating with the university. 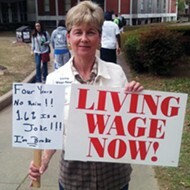 The living wage campaign turned into the United Campus Workers (UCW) union and expanded its focus to workers' rights on the campuses of UT-Chattanooga and UT-Martin before making its way to Memphis in 2010. The UCW has been active in Memphis since then — first at the UT Health Science Center, where it managed to convince UT to reduce a proposed layoff of 200 workers down to 30. Most recently, it has promoted a living wage campaign at the U of M.
Although anyone who receives a check from a public university can join the UCW, no public university in Tennessee is legally required to recognize the union because Tennessee is a "right-to-work" state. Tom Smith, head organizer of the UCW, said that dates back to the Jim Crow laws. "One of the legacies of Jim Crow is that a lot of the basic rights that workers have in other parts of the county are prevented to us," Smith said. "We have a national right to bargain collectively, but the universities we work for have no legal obligation to recognize our needs." The main goal of the UCW is to campaign for a living wage for all university employees through communications with administration and lobbying at the state capital. In 2011, the organization saw its efforts rewarded when the Tennessee Board of Regents (TBR) approved a 3 percent pay increase or a minimum of $750 a year for all university employees governed by the TBR. This fall, the U of M raised its base pay from $8.50 to $8.75 per hour, making it the highest base rate for a public university in Tennessee. Smith said that although he was happy the TBR passed the $750 dollar minimum, the UCW would ultimately like to see a minimum raise of $1,000 for all employees. U of M graduate assistant and UCW volunteer Cole Weintraub said broken communications between the union and the university make it hard for the UCW to push for more workers' rights in the future. "If the University of Memphis chooses to recognize the UCW, they can, but once they do, there are legal obligations that they have to fill, and they haven't done that yet," Weintraub said. "[Because of the] laws [that are] in place, they are basically saying that they aren't going to recognize us until we make it impossible for them not to." Memphis city council member and U of M business law professor Lee Harris said he believes the only voice available to U of M employees regarding a living wage is the UCW. "Without the UCW, we would continue to have a model that exacerbates a wrong pay scale. Our current pay scale is not based on performance. It's not really based on anything," Harris said. "I don't think there is any real concern to do anything about salary equity here at the university," Harris said. "There's no equal opportunity employment office here, and it just doesn't seem like they are taking it seriously."